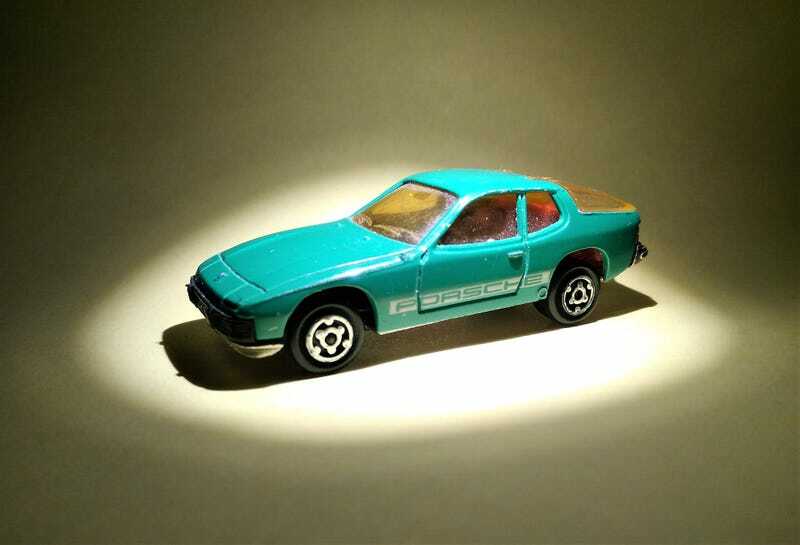 We’ve already seen the Majorette 924 in a post yesterday by AlienProbe - this one’s in slightly nicer condition and in green. Nobody said all the Porsches need to be pretty right? The Majorette 924 (#247) dates to around the time when the 1:1 was new, and features an opening rear hatch. While many Majorettes featured molded objects in the trunk area, this one is comparatively sparse. The 924 was introduced as Porsche’s replacement for the Volkswagen-Porsche 914. Development began as another collaboration between Volkswagen and Porsche, Volkswagen lost interest and development was handed over to Porsche. The project became the first street Porsche with a front engine. Evolutions of the basic design continued with the 944, 924S, and ultimately the 968. Detail is excellent, with sharp panel lines, number plates, and a raised hood badge. Like some other Majorettes of the era, the dashboard piece is connected to the black front bumper, with a nice steering wheel. Most releases of the 924 featured the white PORSCHE stripe, although a couple were plain-coloured, with clear windows. All featured a red interior, to allow for red tail lamps. I also have a playworn red 924. The red one was a cheap eBay lot find, while the green one was a cheap flea market find.